There are many things that you can buy cheap and are just as good (or sometimes better) than their more expensive versions. For example, you can buy a super nice top of the line poncho at Cabela's to keep you dry when it rains for $40...or...you can buy a cheap plastic poncho at Wall-mart to keep you dry when it rains for $1. Both of these Items effectively do the same thing, but one costs almost nothing while the other costs almost a tank of gas! On the other hand, there are a few items that you must spend some money on to get good quality. If you go cheap on any of these key pieces of equipment you will soon find that they are not good enough to get the job done, and you will end up spending more money in the long run to get the good stuff. It's buy nice or buy twice. Yes, I put camera on the cheap list. For the average person, there is no reason to spend money on a top of the line dslr. I see so many people on the trails (and everywhere) who have no idea how to use their $1000 cameras. I'm going to tell you a secret. Unless you are a professional photographer, you can get equally good (or bad) photos with the cheapest point and shoot out there. The technology in today's consumer digital cameras can produce very good quality images. Even the camera on your smartphone is more than sufficient enough to capture great images of the beautiful scenery on your hikes. Unless you are going to make 4 foot fine art prints and try to sell them, you don't need to spend that kind of money and haul a heavy dslr up a mountain. The second list can get quite pricey. If you are willing to compare prices and wait for the right deals to come along, you can make this last section much easier on your wallet. Below are the best places I have found to acquire the high quality necessities on our list. Good old fashioned yard sales in your neighborhood can hold hidden treasures. People just want to get rid of their stuff, and sometimes their stuff is valuable camping gear. Just last week I found a couple nice Thermarest sleeping pads for 10 bucks each! I don't recommend REI if your trying to save money. But, the REI garage sales usually have like new used equipment that was returned to the store in excellent condition. I have bought some of my more expensive items at these garage sales for a fraction of the price new. The only downside to this is that the merchandise is sold as-is. No returns. So you need to make sure you know exactly what you're looking at before you buy. Same thing here, you usually don't get to return used gear, but there are great bargains. 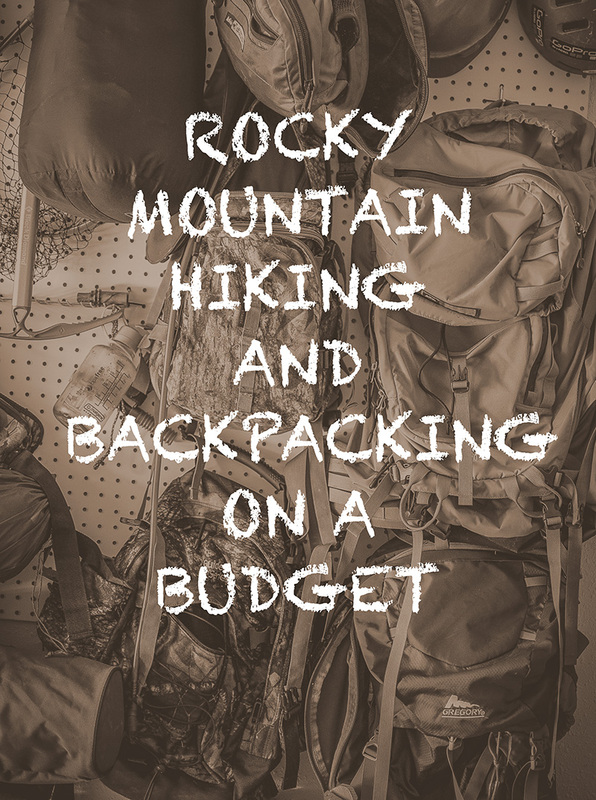 Hopefully this is a helpful bit of information to people wanting to start getting into adventures in the Rockies and save some cash. If you want to view a complete list of my backpacking gear and individual recommendations, click on the link below.